Angina is a specific form of chest pain that happens when the blood flow to the heart decreases. This usually comes about due to partial obstruction of one of the coronary arteries and results in pain, sensation of pressure, or having the chest squeezed. Pain from angina is easy to mistake for a heart attack, but angina fades quickly and does not cause the lasting damage a heart attack is capable of. Having said that, angina is often a symptom of another cardiovascular condition and can be a precursor to a true heart attack later on. Angina falls into one of three main types that differ primarily in what causes the chest pains to occur. Understanding the type of angina you have can help you determine ways to avoid provoking attacks. Stable angina: This is the most common type. In cases of stable angina, the pain is usually triggered by physical activity or similar stresses. The pain typically lasts for the duration of the activity and for a few minutes after being at rest. Emotional stress and heavy meals have also been associated with stable angina attacks. Stable angina is a large risk factor for developing a heart attack. 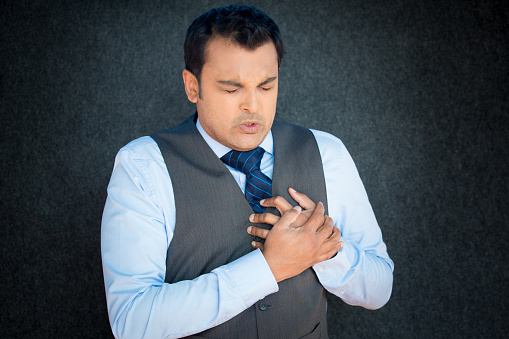 Unstable angina: Cases of unstable angina lack obvious triggers. They can occur while at rest or otherwise inactive and produce strong, long-lasting pain that is capable of coming in repeated waves. Unstable angina is sometimes a sign that a heart attack is imminent and warrants immediate medical attention. Prinzmetal’s angina: This is a rare variant that can happen when at rest or while asleep. It is similar to unstable angina, but the two differ in their cause. Stable and unstable anginas are largely the result of plaque or other obstructions being present in the arteries. Prinzmetal’s angina is caused by the arteries to the heart suddenly tightening or narrowing. It is also the only form of angina that doesn’t come with a heart attack risk. It cannot be overstated that angina is a serious medical condition that warrants a doctor’s intervention. Your medical provider will likely prescribe one or more medications meant to widen the blood vessels, prevent blood clots, or otherwise lessen the burden on your heart to reduce the occurrence of angina attacks. In some cases, surgery may be needed to better restore the blood flow to your heart. Angina is usually caused by plaque that builds up in the arteries. This arterial plaque is made of various substances including cholesterol, fat, and various waste products from cells. Although there are no natural remedies that can eliminate the pain of angina, there are some methods that can be employed at home to reduce your cholesterol buildup and reduce your risk of further complications. These are among the most crucial steps you can take in responding to your angina. If you are a smoker, quit if possible, as smoking hastens the hardening of arteries. Avoiding fatty foods with lots of saturated fats and (if diabetic) managing blood sugar are also key steps. It’s important to avoid events which can trigger angina attacks. This can mean refraining from physical exertion, taking frequent breaks, or avoiding large meals. Your doctor can recommend an angina-safe exercise plan if needed. Vitamin C helps the body control its cholesterol levels and sufficient levels can slow the accumulation of arterial plaque. Citrus fruits or juices like pineapple, lemon, and oranges are strong sources of Vitamin C.
Onions contain an antioxidant called quercetin, a substance that is said to be good for the heart. Specifically, quercetin is linked to reducing hardening of the arteries, high blood pressure, and heart attacks. Since angina can result in arterial hardening and heart attacks, keeping up on the onion intake can be a big help. As an added bonus, quercetin is also known to reduce the development of gallstones. Cholesterol is more dangerous when it has become oxidized in the body. In this state, cholesterol is more reactive with the surrounding tissue and can speed up arterial hardening and other symptoms of plaque growth. This is what makes turmeric useful. The active ingredient in turmeric is curcumin, an antioxidant known to be effect with cholesterol. Since stress can provoke angina attacks, finding means to relax and calm yourself are important steps in managing the condition. Meditation, yoga, or other means can be effective in reducing emotional stressors. High blood pressure can exacerbate the symptoms of angina. As excess sodium intake can raise blood pressure, it’s best to decrease your intake of salty foods. As mentioned previously, angina can result from the hardening of the arteries. It can also happen when blood vessels and arterial walls constrict and narrow. The magnesium in basil helps blood vessels and arteries to relax, easing this particular symptom and promoting blood flow. Additionally, basil contains good amounts of vitamin A, which has antioxidant properties that can help reduce the buildup of cholesterol. If your medication and home remedies aren’t providing proper relief, your doctor may consider more advanced interventions. The two main surgical options for angina are angioplasty or coronary bypass grafts. Angioplasty: This procedure is also called “stenting.” A narrow tube is threaded through a blood vessel and up to one of the coronary arteries. A balloon is then inserted and inflated within the artery to widen it and restore blood flow. Sometimes, the artery will stay open on its own. In other cases, a mesh tube called a stent needs to be placed to keep the artery open. Coronary artery bypass grafting (CABG): This is a more complex procedure where a healthy artery or vein is taken from one part of the body and used to bypass an obstructed, collapsed, or blocked blood vessel. CABG effectively creates an alternate route for blood to flow to or from your heart. Angina can be an uncomfortable, scary, and painful condition to live with, but it’s also one that can be treated. Maintaining a healthy lifestyle and following your doctor’s instructions are the key steps to improving your heart health and quality of life. “Angina – Lifestyle and Home Remedies,” Mayo Clinic web site, February 3, 2015; http://www.mayoclinic.org/diseases-conditions/angina/basics/lifestyle-home-remedies/con-20031194. “Clogged Arteries (Arterial Plaque),” WebMD web site; http://www.webmd.com/heart-disease/clogged-arteries-arterial-plaque?page=3#1, last accessed October 2, 2015. “Angina (Chest Pain),” WebMD web site; http://www.webmd.com/heart-disease/guide/heart-disease-angina?page=3#2, last accessed October 2, 2015. “Home Remedies for Chest Pain (Angina),” Top 10 Home Remedies web site; http://www.top10homeremedies.com/home-remedies/home-remedies-chest-pain-angina.html, last accessed October 2, 2015. Morgan, R., “The Effects of Onions on Cholesterol & Blood Sugar,” Livestrong.com, last updated February 18, 2015; http://www.livestrong.com/article/475598-the-effects-of-onions-on-cholesterol-blood-sugar/, last accessed October 2, 2015.